The University of Alberta’s Faculty of Kinesiology, Sport, and Recreation is excited to announce Research Revealed: Undergraduate Forum for Kinesiology, Exercise Science, Sport Studies and Recreation to be held on March 31st 2017 at the University of Alberta. Research Revealed is a one-day undergraduate conference for students in kinesiology, physical education, sports studies, exercise science, recreation and leisure studies or other related areas of study. For the first time, the University of Calgary’s Faculty of Kinesiology is our co-host, and students from across Alberta and Saskatchewan have been invited to join the conference. Undergraduate students will present their research as posters or oral presentations, and there will be two keynote speakers (one each from the University of Alberta and the University of Calgary).There is a networking event for faculty and student from 3:30 - 6 pm. Students in the Faculty of Physical Education and Recreation are eligible to apply for conference grants to cover conference fees. See Student Services (3-134 University Hall) for how to apply. - Note that this presentation meets the requirements of presenting your work for the Research Certificate in Kinesiology and the Sustainability Certificate. - Your poster printing costs can be covered by the Associate Dean of Undergraduate Programs. Contact per.research.revealed@ualberta.ca to find out more. Registration opens February 1st and ends March 24th. The registration fee is $35 for all participants (i.e., whether you are presenting or attending, and whether you are a student or faculty.) Lunch and nutrition breaks are included in the fee. Answer the prompts with the provided Login ID and PIN #. Please make sure you have also completed the registration information here. You are invited to submit a poster for this event. We invite all undergraduate students who have completed or will be completing research projects of various formats to submit an abstract. Studies from any discipline across the broad topics of kinesiology, recreation, leisure, and physical education are eligible. The abstract should have a title, and a few sentences about the research you have done or that you will complete. An example of how to structure an abstract is here . If your abstract is accepted you will most likely be invited to give a poster presentation. Some abstracts will be selected for short oral presentations. If you wish to be considered for an oral presentation, please indicate this when you submit your abstract. Submit your abstract here before 8 am on March 10, 2017. Awards will be given for the best presentations and posters on the day. All registered participants will receive a Certificate of Attendance or a Certificate of Presentation. To see examples of past research posters presented by undergraduate students visit here. Presentation Overview: This presentation will provide a brief overview of Dr. McHugh’s collaborative program of research that seeks to better understand the physical activity and sport experiences of Indigenous youth. By drawing on examples from her research, she will describe how the processes of engaging in research are often more important than the outcomes. As well, she will discuss how the lessons learned from her research can be applied to a variety of careers within kinesiology. Bio: Dr. Tara-Leigh McHugh is an Associate Professor in the Faculty of Kinesiology, Sport, and Recreation at the University of Alberta. Her program of research is focused on enhancing the sport, physical activity, and body image experiences of youth. She has extensive experience working with Indigenous youth, and her commitment to community-based approaches and the sustained engagement of local Indigenous experts has supported the success of her nationally funded program of research. Presentation overview: Injuries in Youth Sport and Recreation: Prevention is the Best Medicine. Public health burden of injury in youth sport and recreation; risk factors for injury in youth sport and recreation, prevention strategies in youth sport and recreation. Bio: Dr. Emery is a physiotherapist and her PhD in Epidemiology is from the Department of Public Health Sciences, Faculty of Medicine, University of Alberta. She is the Associate Dean (Research) in the Faculty of Kinesiology, University of Calgary. The primary focus of Dr. Emery’s research program is the identification of risk factors for injury and evaluation of prevention strategies to reduce the risk of injury in youth sport and recreation. This includes prevention of longer term sequelae, including osteoarthritis, to promote active and healthy lifestyles and to maximize the benefits of rehabilitation in pediatrics and sport medicine. Faculty and students are invited to chat over snacks and drinks in the VVC Student Lounge from 3.30 pm - 6 pm. This is a great way to talk about possible undergraduate research or graduate studies in a relaxed atmosphere. A cash bar will be available, as well as complimentary non-alcoholic drinks. And we have 3 door prizes to give away, including a Fitbit! Come along and say hi! Research Revealed is being held in the Van Vliet Complex at the University of Alberta. 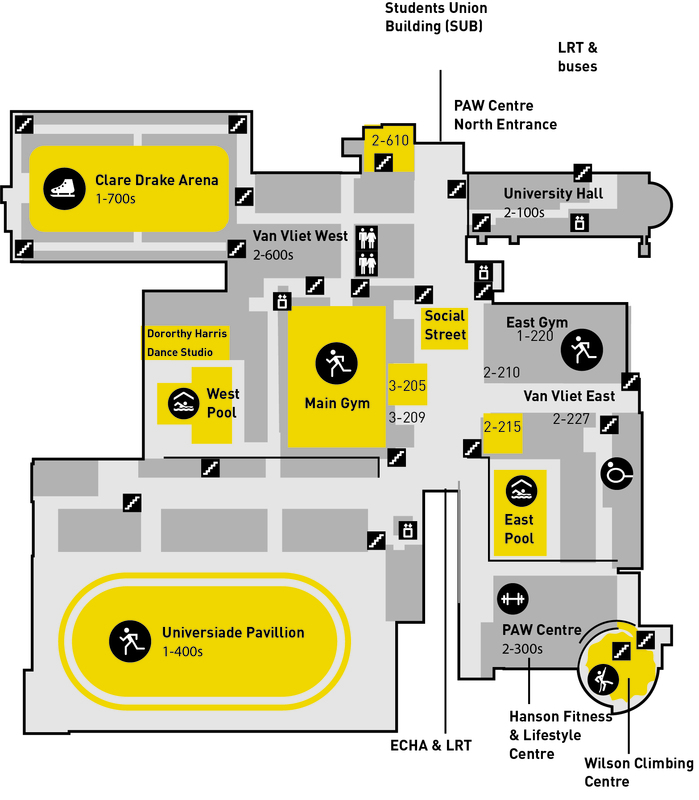 Talks and posters will be scheduled on levels 2 and 3 of the Van Vliet Complex, and in level Lower 1 of the Edmonton Clinic Health Academy . All conference rooms and spaces are wheelchair accessible. The Red Arrow shuttle services from Calgary & Red Deer, Lethbridge, Fort McMurray, and Cold Lake all stop in Downtown Edmonton near the Bay/Enterprise LRT station. From here, travel in the Century Park direction to the University or Health Sciences stations to reach the Van Vliet Complex on campus. The Edmonton Sky Shuttle provides transportation to and from the Edmonton International Airport. Rides must be pre-booked online at edmontonskyshuttle.com or by phone (1-780-465-8515). The rate for a one-way trip is $18 and $30 for a round trip. Sky Shuttle service is available to and from stops close to the conference rooms: the U of A hospital (114th St stop) and U of A Lister Hall (11595-87 Ave). Bus and LRT schedules can be found here . Complimentary university parking passes are available to groups who are travelling together from outside of Edmonton. Please contact per.research.revealed@ualberta.ca to arrange your parking pass.